Donegal forwards Christy Toye and Patrick McBrearty have been handed starts for Sunday's All-Ireland SFC final against Kerry at Croke Park. The pair, who impressed as substitutes in the semi-final victory over Dublin, replace David Walsh and Rory Kavanagh. Neil Gallagher started as full-forward against the Dubs but he will play in midfield alongside Odhran MacNiallais. Kerry have recalled corner-back Marc O Se while fit-again Stephen O'Brien returns to the attack. O Se was dropped for the semi-final replay against Mayo but came on for Shane Enright at the Gaelic Grounds. O'Brien replaces Michael Geaney at wing-forward while Kieran Donaghy, as expected, is retained at full-forward. Colm Cooper, who underwent cruciate ligament surgery in February, has not been included in the Kerry subs although intriguingly he is named as one of the Kingdom's additional panellists. Whether that indicates that he could play a part in Sunday's game remains to be seen. Toye grabbed his chance after coming on for Walsh before half-time in the semi-final win over Dublin. 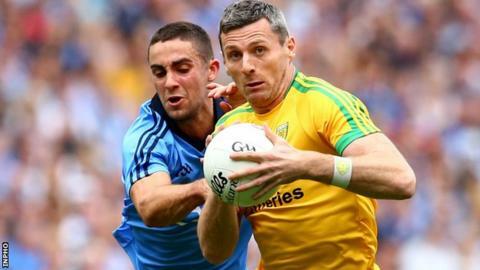 Kilcar clubman McBrearty was introduced in the second half to great effect as Donegal stunned the All-Ireland champions. Kerry: Brian Kelly; Marc O Se, Aidan O'Mahony, Fionn Fitzgerald (captain); Paul Murphy, Peter Crowley, Killian Young; Anthony Maher, David Moran; Stephen O'Brien, Johnny Buckley, Donnchadh Walsh; Paul Geaney, Kieran Donaghy, James O'Donoghue. Subs: Brendan Kealy, Shane Enright, Michael Geaney, Declan O'Sullivan, Bryan Sheehan, Barry John Keane, Darran O'Sullivan, Kieran O'Leary, Jonathan Lyne, Mark Griffin, Pa Kilkenny. Donegal: Paul Durcan; Eamonn McGee, Neil McGee, Paddy McGrath; Anthony Thompson, Karl Lacey, Frank McGlynn; Neil Gallagher, Odhran Mac Niallais; Christy Toye, Leo McLoone, Ryan McHugh; Patrick McBrearty, Michael Murphy (captain), Colm McFadden. Subs: MIchael Boyle, Darach O'Connor, David Walsh, Declan Walsh, Dermot Molloy, Hugh McFadden, Leon MacThomais, Luke Keaney, Martin McElhinney, Martin O'Reilly, Rory Kavanagh.